In 1998, 3 years after Yahoo took the internet by storm, the to-be search giant, Google, was found. However, we all know every other search engine in the world is far behind in the race compared to Google. With innovative ways of reaching an audience and helping them with effective solutions, Google has secured a very safe position. While most people prefer Google for being rich in information, Google has been facing criticism and allegations recently. Sundar Pichai, the CEO of Google even testified before the US Parliamentary Committee over these allegations. The concerns that were raised in this meeting were regarding data protection policies. While Pichai dodged these questions with well-worded answers, there is still some fogginess concerning the matter. Oddly enough, the European continent is not a big fan of Google, despite people still preferring to use the search engine. Constant cases of Google being penalized and having to follow strict European Union regulations is proof of this. However, people still haven’t given up using the search engine. 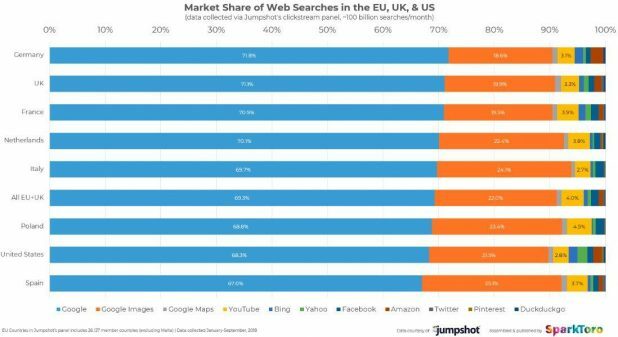 Rand Fishkin, the founder of Moz, conducted a little study to find out if Google is the most preferred search engine in not only the US but Europe and the UK as well. The European Union claimed they have been putting constant effort into finding an alternative to Google. Fishkin’s data, however, contradicts these claims. To make all of this clearer, Jumpshot, which is an advanced marketing analytics platform, provided Rand Fishkin with some statistics. 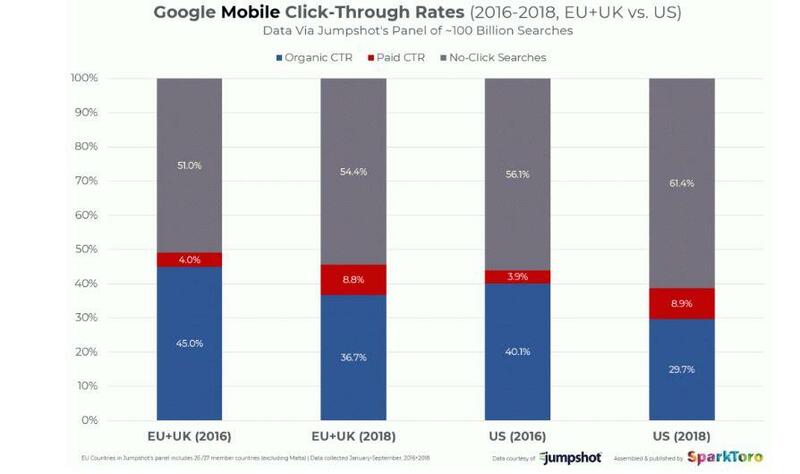 These stats suggest that people from the European Union and the UK make use of Google Search a lot more than those in the US. The stats claim that while only 68.30% of people in the US use Google as their primary search engine, 69.27% of people use it as their go-to search engine in Europe as well as the UK. The data taken and analyzed from January to September, 2018, , shows that Bing, Yahoo, and other search engines have constantly failed to erode Google’s popularity. Jumpshot analyzed around 252 million searches in 26 European countries, except for Malta. The research agency also retrieved 73 billion search records from the UK, which was the largest sample. 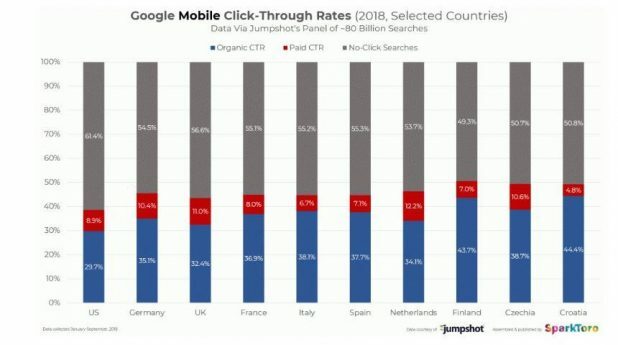 Based on the individual analysis made for European countries along with that of the US, the highest search market share for Google was in Germany at 71.8%. The lowest was in Spain at 67%. And, as mentioned earlier, Google’s search market in the United States was 68.30%. If we consider Google Images, YouTube and Google Maps as separate entities, Google’s parent company, Alphabet, has an average, overall market share of 90% in both the US and the EU. Additionally, when you look at the graph, the data clearly suggests how Facebook, Twitter, Amazon, DuckDuckGo, and Pinterest only have 9% of the market share, even after combining all of their market shares. If you look at the data, it clearly indicates that Google is taking over the search engine landscape and outsmarting the other search engines. While Facebook and Twitter would like to claim they are becoming more popular in the search market, these stats make those claims questionable. However, the searches on these platforms do not qualify for a parallel analysis with Google. This is because the searches that take place on these e-commerce and social media platforms are either for products or for individuals. Jumpshot also provides insight into data for website owners, which is more from the user’s point of view. Data based on 100 billion searches made in Europe, the UK, and the US shows that the average click-through rate for websites on smartphones and desktops has been constantly ebbing. Google has also been causing a sharp decline in the click-through rate for websites that hold the top 3 ranks in the organic SERP results. 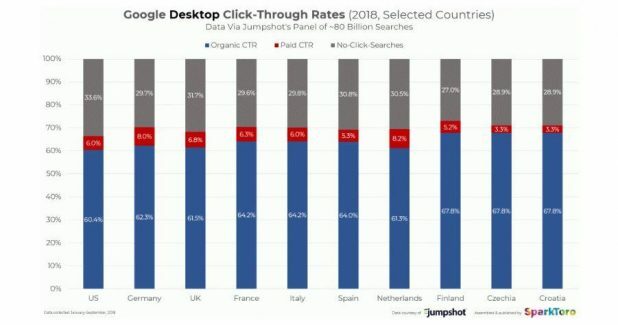 Jumpshot suggests that ever since Google introduced the Instant Answers box and Google ads, it has become difficult for the top 3 ranking websites to get the expected Click-Throughs. Since click-through rates govern the survival of a website, we can say that Google is causing a threat to these websites. 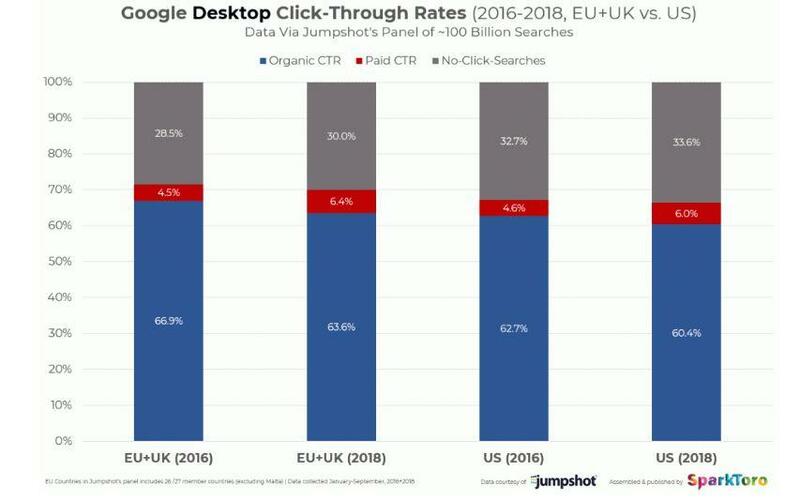 If you take a look at the graph below, you will notice a drop of 3.3% and 2.3% in organic traffic when compared to the desktop search result trends in 2016 and 2018 in Europe and the US. Moreover, when we talk about data for mobile devices, sadly, it isn’t good news for website owners either. The graph below shows a drop of 4.8% and 5% when you compare the data of 2016 and 2018 in Europe and the US. The country with the lowest desktop average click-through rates was the US at 60.4% with the Netherlands coming in second at 61.3%. The stats for mobile click-through rates were even more alarming. Finland had the highest click-through rate for mobiles at 43.7% and the US had the lowest at 29.7%. It’s apparent that Google features like Instant Answers, Google ads, and Knowledge panels are trying to dominate websites for clicks on both mobile phones and desktops. Furthermore, the data for 2018 makes it clear that there is a rise in the number of people who click on paid ads while using their mobile phones or desktops. It’s obvious that Google wants to prioritize its features over websites that are displayed in the organic search results. Click-through rate is an important factor but Google is making websites strive harder to optimize their content to rank #0 in Google Search. Websites may secure the position with Instant Answers, but rarely does this result in traffic to the website. This is because whatever users are looking for appears right in front of their eyes without them having to visit the website. Consequently, websites are facing a serious threat from these 0 click-through results. Since Google is the master of search, it’s important to find new ways to reward websites that rank at #0 position for Instant Answers. We saw this happen when website owners witnessed benefits even as the page would load in Google’s server with AMP. Furthermore, Google allowed webmasters to put ads on their AMP pages, and this benefited the websites more. When we look at all the graphs, it points to Google having quite a monopoly on the search engine landscape, putting other platforms to shame and pushing its SERP features to the top positions. Jafar Sadhik is a passionate web enthusiast lured to learn all the happenings of digital marketing industry from 4 years. He, currently, works at Stan Ventures as an SEO content specialist. Now, he is most eagerly researching about how the blogger outreach services have become inevitable in the recent times. The post Analyzing How Google’s SERP Features Impact the CTR’s of Websites appeared first on SiteProNews.